Keep your race car running cool—even in the white hot heat of battle! We’ve got everything you need, including top-quality radiators, fluid coolers, water pumps, fans, thermostats, overflow tanks, coolant additives, and much more. When the competition heats up, keep your cool with the brands you trust. The most-trusted names in automotive cooling are all here: Be Cool, Derale Racing, Howe Racing, AFCO, Fluidyne, and more. 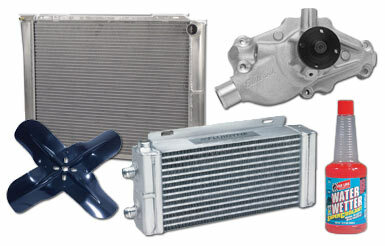 Shop radiators and cooling products at Summit Racing now!